Meanwhile, bank bonuses in other countries are going the other way. Tornto, Ontario downtown, TD Centre and Bay Street banking district seen from Brookfield Place office tower. Canada’s banks slashed jobs this year to make sure earnings looked good amid an oil price slump, but they still found enough money to raise the bonus pool for top managers. The country’s six largest banks set aside $12.5 billion for bonuses, up from $12 billion a year earlier, Bloomberg calculated. Canadian bank bonuses seem to be going in a different direction from those in other countries. A recent study forecast a 9-per-cent decline for U.K. bank bonuses, while a study from Johnson Associates forecasts flat or even slightly shrinking bonuses at U.S. banks. More than a third of the value of Canadian bank bonuses — $4.53 billion — is at RBC alone, where bonuses are up 3.3 per cent from last year. Scotiabank is the only bank to have reduced its bonus pool, down 2.4 per cent to $1.44 billion. It's also the only bank to have seen its profits shrink in 2015 compared to a year earlier. 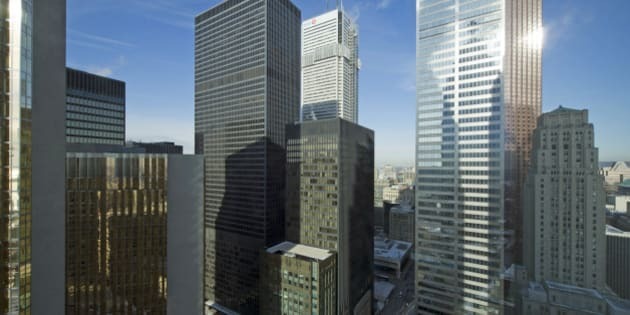 The big national banks reported earnings last week, and between the six of them, they saw profits rise almost 5 per cent, to $34.88 billion from $33.27 billion a year earlier. By HuffPost's calculations, that works out to nearly $4 million in profit every hour of every day in fiscal 2015. But they are making these profits amid an oil-driven slump in economic activity, and they have been chopping jobs to help reach earnings targets. According to a report at the CBC's international radio division, the big banks have shed 4,600 jobs in total this year. The latest job cuts announcements came last month, when Scotiabank, TD Bank and National Bank all announced layoffs. "This is simply a reality of today's slower-growth world,'' TD Bank CEO Bharat Masrani said.